The 2011 Toyota Camry Base represents the entry-level trim in its lineup. Despite a lack of available options and upgrades, the Base runs on the same four-cylinder engine used in the higher LE and top-of-the-line XLE trims. The 2.5-liter DOHC 16-valve dual VVT-i produces 169 hp and 167 lb-ft of torque. The Base offers a standard manual six-speed transmission with overdrive (earning an estimated 22 mpg city and 33 highway) with an available automatic six-speed transmission (and mileage estimates of 22/32). The performance of the Base four-cylinder engine is deemed adequate by most, and unfortunately, an upgrade to the more powerful V6 is not available at this trim level. The 2011 Camry Base remains largely unchanged from its 2010 incarnation and has a somewhat limited list of standard features and options. Outside, the trim has standard projector-beam headlights, LED rear lights, and rolls on 16-inch steel wheels. Inside, the Base offers a standard tilt-telescoping steering wheel with integrated audio controls, standard cruise control, filtered CFC-free air conditioning, and power windows and locks. The fabric-covered seats offer a manually adjustable driver’s seat with vertical seat-height adjuster. Rear seats split 60/40 to allow for additional trunk space. Only one stereo appears in the Base—an AM/FM/CD stereo with MP3 capability, six speakers, and an auxiliary audio jack—with no available upgrades. Take a step up from the 2011 Camry’s entry-level Base trim and you’ll land in the 2011 Toyota Camry LE. Although the LE matches the Base trim’s four-cylinder standard engine (a 2.5-liter DOHC 16-valve dual VVT-i producing 169 hp and 167 lb-ft of torque), the LE is also available with a V6, which offers greater power and better handling. Similar to the Base, the front-wheel-drive LE comes with a standard manual transmission (and mileage estimates of 22/33 mpg) with an available automatic transmission that only slightly reduces mileage estimates to 22/32. Little has been altered for this year’s Camry LE. The 2011 trim has standard projector-beam headlamps with LED tail, stop, and side marker lights, and 16-inch steel wheels. It does, however, have an available 16-inch, seven-spoke alloy wheel upgrade, as well as an optional power tilt/slide moonroof as part of the Moonroof Package, which also adds rear-seat reading lights. Although many of the 2011 Camry LE’s interior features match those found in the Base (standard tilt-telescoping steering wheel with integrated audio controls, filtered air conditioning, power windows and locks), the LE does add several new standard elements to the Base’s features. The driver’s seat now has power adjustment with lumbar support, remote keyless entry is included, and the interior is designed with a metallic-style trim. While the Base trim’s stereo (AM/FM CD player, MP3/WMA playback capability, six speakers, and auxiliary audio jack) is the standard offering for the LE as well, there are two available upgrades for the higher trim. The first adds XM radio with a 90-day subscription, a USB port for iPod connectivity, CD-text display function, Bluetooth technology for hands-free phone use, and auto sound leveling. The second option provides a JBL AM/FM 6-CD changer with eight speakers. For Camry drivers looking for a little more “sporty” in their sedan, Toyota offers the 2011 Camry SE trim. The SE uses a slightly tweaked version of the four-cylinder engine found in the Base and LE trims: a 2.5-liter four-cylinder DOHC 16-valve with dual VVT-i that produces 179 hp and 171 lb-ft of torque (exceeding the numbers for the four-cylinder Base, LE, and XLE). The SE four-cylinder comes with a standard manual six-speed transmission, but the front-wheel-drive vehicle does have an available automatic six-speed at this trim level. Mileage estimates match those of the Base and LE trims, with 22 mpg city and 33 highway for the manual transmission and 22/32 with the automatic. While the Camry has been praised for having a comfortable, if somewhat soft ride, the SE’s sport-tuned suspension has been criticized for failing to compensate completely for lean in the corners, as well as delivering an only slightly firmer suspension than the other soft-riding trims. The SE’s exterior attempts to add a sporty look to the otherwise bland midsize sedan. The headlamps feature a smoked sport trim and integrated foglamps. Larger, 17-inch, five-spoke machine-finished alloy wheels replace the smaller 16-inch wheels found on the Base and LE trims, and the SE features a standard blackout front sport grille. In addition, heated outside mirrors, a power tilt/slide moonroof, and a rear spoiler are available options for the SE trim. The 2011 Camry SE shares many standard features with the other trim levels in this year’s model: remote keyless entry, tilt-telescoping adjustable steering wheel with integrated audio controls, standard cruise control, power windows and locks. However, other elements are designed to make the SE stand out as Camry’s sport trim, including a standard three-spoke leather-wrapped sport steering wheel and shift knob, sport fabric-trimmed seats, aluminum details on the door sills and sport pedals, and blue Optitron sport meters on the dash. Unlike the other trim levels, the SE has a fixed rear seat, with only a central pass-through to the trunk, which is slightly smaller than the trunk of the Base or LE trims. The number of available options for the Camry increases at the SE trim level as well, with available heated leather seats and a power-adjustable front passenger seat. The basic stereo system for the SE matches that of the Base and LE (standard AM/FM CD player, MP3/WMA playback capability, six speakers, and auxiliary audio jack), but upgrades can add XM radio, a USB port for iPod connectivity, Bluetooth technology, a JBL AM/FM 6-CD changer and eight speakers, and a voice-activated, touch-screen DVD navigation system with integrated backup camera. Other available technology for the SE includes the optional Smart Key System and HomeLink Universal Transceiver (as part of a package). Consumers who want to add a few extras to the Camry Base may want to consider the 2011 Toyota Camry LE V6 trim. With the addition of a V6 engine, the LE goes from an adequately powered four-cylinder (good for commuting and saving on gas) to one that out-powers many of its competitors. The 3.5-liter V6 DOHC 24-valve engine with dual VVT-i produces 268 hp and 248 lb-ft of torque. This V6 engine is paired only with a standard six-speed automatic transmission (rather than the standard manual six-speed found in the four-cylinder LE) and a front-wheel-drive setup, generating slightly lower mileage estimates of 20 mpg city and 29 highway. The 2011 Camry LE V6 strongly resembles its 2010 appearance, with standard projector-beam headlamps, LED rear lights (for tail, stop, and side marker lamps), and the same standard 16-inch steel wheels found in the Base trim. Unlike the Base, however, the LE V6 does have the option of a 16-inch seven-spoke alloy wheel upgrade. The power tilt/slide moonroof also becomes an available option at this trim level as part of the Moonroof Package, which also adds rear-seat reading lights. Inside the LE V6, standard features include a tilt-telescoping steering wheel with integrated audio controls, filtered air conditioning, power windows and locks, and cruise control. However, the LE V6 adds several standard elements, including remote keyless entry, a power adjustable driver’s seat (including lumbar support), and a metallic-style interior. The standard stereo for the LE V6 mirrors the Base trim’s, with an AM/FM CD player, MP3/WMA playback capability, six speakers, and auxiliary audio jack. Unlike the Base, however, the LE V6 can upgrade its sound with two available options. The first adds XM radio with a 90-day subscription, a USB port for iPod connectivity, CD-text display function, Bluetooth technology for hands-free phone use, and auto sound leveling. The second increases sound quality even further with a JBL AM/FM 6-CD changer with eight speakers. The “sporty” version of the 2011 Toyota Camry is the SE trim, available with a 3.5-liter V6 DOHC 24-valve dual VVT-i version (the same V6 offered for the LE and XLE trims). While the SE’s four-cylinder sport engine delivers slightly greater power than those in the non-sport four-cylinder trims, the V6 also increases power, with 268 hp and 248 lb-ft of torque—greater than many of the competitors in its class. The V6 uses a standard six-speed automatic transmission in the SE, rather than the six-speed manual found in the four-cylinder version. Mileage estimates mirror those found in the V6 versions of other Camry trims, with 20 mpg city and 29 highway. While the Camry has been praised as a comfortable ride, other trims have been criticized as overly soft, with notable lean in the corners. The SE attempts to compensate for these negatives with sport-tuned shock absorbers, springs, and strut-tower and trunk-mounted braces. Although the Camry is typically pegged as a bland family midsize sedan, the SE V6 attempts to create a sportier look with a standard smoked sport trim on the headlamps, integrated foglights, a blackout front sport grille, and larger, 17-inch, five-spoke machine-finished alloy wheels. An optional rear spoiler can also change the sedan’s look¸ and heated outside mirrors and a power tilt/slide moonroof (as part of a package) present other available options for the trim. Many of the 2011 Camry SE V6’s standard features match those of the other trim levels: remote keyless entry, a tilt-telescoping adjustable steering wheel with integrated audio controls, standard cruise control, power windows and locks. However, the SE V6 separates itself from the Camry crowd by adding sporty details, including a three-spoke leather-wrapped sport steering wheel and shift knob, sport fabric-trimmed seats (which can be upgraded to heated leather with a power-adjustable front passenger seat), aluminum details on the door sills and sport pedals, and blue Optitron sport meters on the dash. The rear seat of the SE V6 is fixed, with only a central pass-through to the trunk. The standard stereo in the SE V6 mirrors that of the Base and LE trims, with AM/FM CD player, MP3/WMA playback capability, six speakers, and auxiliary audio jack. Optional upgrades for the SE V6 include XM radio, a USB port for iPod connectivity, Bluetooth technology, a JBL AM/FM 6-CD changer with eight speakers, and an optional voice-activated touchscreen DVD navigation system with integrated backup camera. The Smart Key System (which unlocks and starts the car via sensors) and the HomeLink Universal Transceiver (which programs three remote devices to one control) are also available for the SE V6. The XLE represents the 2011 Toyota Camry’s top-of-the-line trim. Despite other, more luxurious features, the engine of the XLE matches the four-cylinder found in the Base trim. The 2.5-liter DOHC 16-valve VVT-i engine produces 169 hp and 167 lb-ft of torque, yielding enough power for a comfortable family or commuter ride, if not optimal power for driving enthusiasts. Unlike the Base and LE trims, however, the front-wheel-drive XLE comes with a standard six-speed automatic transmission (rated at 22 mpg city and 32 highway) rather than a six-speed manual. The 2011 Camry XLE resembles the 2010 model, providing standard 16-inch, 10-spoke alloy wheels, heated outside mirrors, and a power tilt/slide moonroof. Like the Base and LE trims, however, the XLE maintains projector beam headlamps and rear LED lights, and matches the SE sport trim’s integrated foglights. The inside of the XLE also shares common elements with lower trim levels, including a remote keyless entry system, standard cruise control, power windows and locks, and a tilt/telescopic steering wheel. However, other features distinguish the top-of-the-line trim from the rest: The dash now displays additional information about outside temperature, fuel economy, and average speed, among other data. The four-spoke steering wheel is wrapped in leather, and the metallic interior is now detailed in “wood-grain-style.” Both the driver's and passenger front seats are power-adjustable, and their fabric is treated with Fraichir, which is supposedly gentler on the skin. Heated front seats and leather are available options at this trim level. The rear seats recline for passenger comfort, but this feature limits access to the trunk, which is slightly smaller than that of the Base and LE trims. Rear-seat comfort is also addressed with a standard manual rear sunshade and rear-seat reading lights. Interior air quality is improved with a dual-zone climate control that offers filtration and a Plasmacluster ionizer. Technology in the XLE starts with a standard JBL AM/FM 6-CD changer with MP3 playback, eight speakers, XM Radio with a 90-day subscription, USB port for iPod connectivity, and Bluetooth technology. HomeLink is standard, allowing drivers to program a single unit to control up to three devices (e.g., garage door). Upgrades and options for the XLE also include the Smart Key System (which automatically unlocks doors and remote-starts the engine), and a voice-activated DVD navigation system with an integrated backup camera. 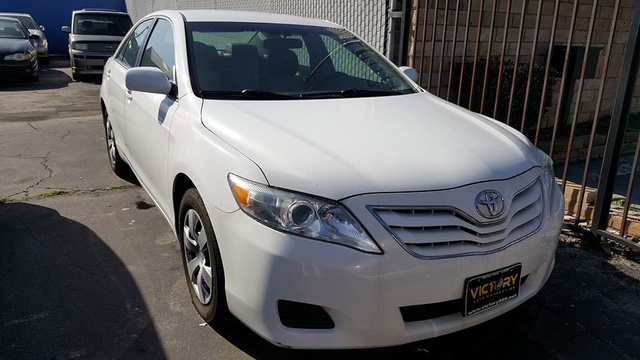 For drivers choosing to “go green,” the 2011 Toyota Camry is available in a Hybrid trim, combining a gas engine with an electric motor powered by a battery (no plug-in required) and producing a net power of 187 hp. The Hybrid Synergy Drive alternates power sources between the electric and gasoline engines, depending on the driving conditions and demand. The Hybrid uses an electronically controlled continuously variable transmission (ECVT), which operates like an automatic with mileage estimates of 31 mpg city and 35 highway. Note that the Hybrid’s rack-and-pinion steering has earned some criticism for a lack of responsiveness, and the soft suspension produces a noticable lean in cornering on road tests. The outside of the Hybrid features projector beam headlamps with Hybrid Synergy Drive blue accents and standard LED tail, stop, and side marker lights. Integrated foglights are an available option for the trim. The Hybrid offers standard 16-inch steel wheels, although 10-spoke alloy wheels are available through an upgrade package, as are a power tilt/slide moonroof and heated outside mirrors. The Hybrid’s list of standard features includes remote keyless entry, the Smart Key System (not a standard feature in any other Camry trim), a tilt-telescoping steering wheel that integrates audio and climate controls, cruise control, and power windows and locks. Similar to the high-end XLE trim, the Hybrid’s seats are fabric-covered and treated with the Fraichir process (in which the fabric is coated to offer moisturization for the skin), but leather-trimmed and/or heated seats are available as part of a package. The interior of the Hybrid features a metallic look with chrome accents, although wood-style trim for a more luxurious look is available as an option. The driver’s seat can be power-adjusted, and the rear seats fold with a 60/40 split to access a trunk smaller than any other Camry trim’s (10.6 cubic feet). The Hybrid’s instrument panel uses an Optitron display and includes a variety of information readouts including the Eco Drive level, an energy monitor, outside temperature, average fuel economy, and other details. Similar to the XLE, the Hybrid’s dual-zone automatic climate control filters dust and pollen while reducing germs with the Plasmacluster ionizer. The standard stereo of the Hybrid matches that of the Camry Base and LE, with an AM/FM CD player, six speakers, MP3 playback capability, and an auxiliary audio jack. Most upgrades to the Hybrid are available in package form, and can include the HomeLink universal transceiver (which can program up to three remote devices to a single unit), as well as improved stereo quality with a JBL 6-CD changer, eight speakers, XM radio, a USB port with iPod connectivity, and Bluetooth technology for hands-free phone use. A voice-activated touchscreen DVD navigation system with an integrated backup camera is also available for the Hybrid. The XLE represents Toyota’s high-end trim for the 2011 Camry. In addition to a four-cylinder version, the XLE can be purchased with a V6 that earns positive reviews for its power compared to its competitors among midsize sedans. The XLE V6 trim features the engine found in the SE and LE versions: a 3.5-liter DOHC 24-valve dual VVT-i that produces 268 hp and 248 lb-ft of torque. Like its four-cylinder counterpart, the XLE V6 comes with a six-speed automatic transmission and mileage estimates matching those of the LE and SE V6 (20 mpg city and 29 highway). Although powerful, the suspension and handling of the car are notably soft and somewhat slow, making it a good comfortable family or commuter car, but not necessarily the choice of the driving enthusiast. Very little has changed for the XLE trim in its 2011 incarnation. The high-end entry in the Camry line-up rides on unique 16-inch alloy wheels with a 10-spoke design. Heated outside mirrors and a power tilt-slide moonroof are standard for the trim, as well as chrome detail on the dual exhaust pipes. Other standard features, such as projector beam headlights and integrated foglamps, are not unique to the trim, however, as they appear in the Base, LE, and SE trim levels. While some of the Camry XLE’s interior offers features found in lower trims (e.g., standard remote keyless entry, cruise control, power windows and locks, and a tilt-telescoping steering wheel), the high-end XLE V6 does distinguish itself from the others. Additional information is displayed on the dash, such as outside temperature, fuel efficiency, and average speed, and there has been an attempt to make the XLE V6 look more luxurious, with “wood-grain-style” trim, chrome details, and a four-spoke leather-wrapped steering wheel. Both driver and passenger front seats have power adjustments, and the fabric seat covers are treated with Fraichir (which is supposedly kind to the skin). Other high-end features, such as heated or leather seats, remain options even at this trim level. Surprisingly, the rear seats recline for comfort, but the trade-off is pass-through-only access to a trunk that is slightly smaller than that of the Base and LE trims. A standard manual rear sunshade and reading lights improve the rear-seat ride as well. The XLE V6 provides better air quality in the cabin via filtered dual-zone climate control with a Plasmacluster ionizer to reduce germs. A JBL AM/FM 6-CD changer with MP3 playback, eight speakers, XM radio (with a 90-day subscription), Bluetooth technology, and a USB port to plug in an iPod. HomeLink—which allows owners to program up to three remotes to a single, visor-mounted unit—are included at this trim level. The Smart Key System (to unlock doors and start the engine remotely), and a voice-activated DVD navigation system with an integrated backup camera remain available options at the XLE trim level.